We were so lucky to have my niece Ashley stay with us last week. My girls were smitten with having an older cousin to snuggle with and play with. They couldn’t stop staring at her the first two days she was here. It was very adorable. I was thankful for the extra set of hands when corralling two little ones. Ashley and I had fun watching TV and eating snacks, shopping and just laughing once the kids were in bed. Ashley is dating a new boy and left him behind for the entire week. (OMG!) They would text each other from the moment they woke up until the moment they went to bed. This made me kind of chuckle when I remembered my own teenage romance… circa 1990. I was just 15 when I started dating. I fell in love with a boy who’s family lived on opposite sides of the country. Every summer he would hop a plane and travel between families for a few weeks before coming home. I remember thinking this was the biggest heartache I could ever have. Ahhhh teenage naivete. To pass the time until we were united again we had to write each other actual letters. . . on paper. . . using a pen. It was so exciting when we discovered email!! We could fire off a love letter at any time and just had to wait for the once a week we were able to check it! 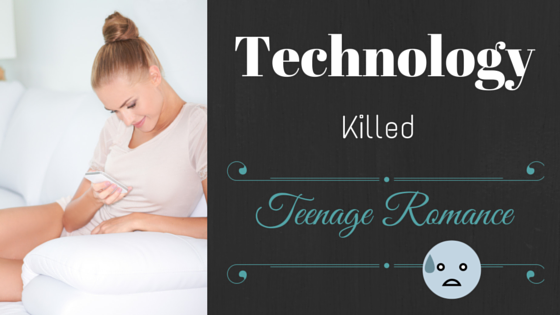 Today teenagers have entire conversations via text messaging! No more hand written letters on carefully selected (and scented) stationary. If we wanted to include a picture of our fun adventures we had to drop off our entire camera at the drug store and wait two days for it to process. Then we put the pictures into an envelop, added a stamp and placed it in a mailbox. It could take up to 5 days for a letter to reach our love. The crazy kids of today can send pics via Snap Chat, Instagram, Twitter, or post on Facebook in a matter of seconds! If we wanted to talk over the phone we had to wait until a certain hour of the day for the cheapest rate. Then we could only talk to each other for 30 minutes (45 if our parents were distracted). We had to pay actual money to talk to each other on the phone. Today teenagers can talk as long as they want at any time of day via Face Time, or Skype, or through any number of apps without the meter running! There are apps and websites that exist today that allow you to track your loved ones airline flight. Back in the dark ages of the 1990’s no such thing existed. I had a hand written itinerary that I copied off of my boy friend’s airline ticket and I just had to wait. It was a guessing game of how much time it would take him to get home. Technology has ruined the teenage romance. No more wondering, “Is he thinking of me?” when you can text him 17 times a day, “are you thinking of me?” “how about now?” “Still thinking of me?” No more mystery of “what is she doing right now?” when you can see all the pics posted on Facebook. I caught myself saying things this week like, “in my day” or “back in the days we didn’t have iphones.” I had to laugh a little at the thought of my 16 year old self tethered to a portable electronic device. It isn’t just the device I’d be tethered to, but the boy on the other side. It might seem convenient to have instant access to your sweetie, but where is the mystery and the romance in that? « To Grandmother’s House We Go! I used to love writing letters when I was younger complete with the stamped sealing wax. I guess that is a lost art now. But The looked beautiful and so romantic. So much of our lives a public now. I’m just glad it wasn’t the way it is now when I was a kid. I would have gotten into so much trouble. This is so true, I’m so glad my husband and I met during the time before all the tech and apps were around and part of everyday life.